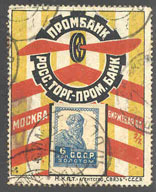 9596 PT RUSSIA (1925) Propeller*. Wheel*. 6 kopeck imperforate stamp tied by cancellation onto beautiful multicolor advertising collar for PROMBANK. These were issued by the Commercial Agency of the Commissariat of Posts and Telegraphs and sold at P.O. counters at face value. Superb example! 10967 PT RUSSIA (1925) Packs of cigarettes*. 7 kopeck stamp tied by cancellation onto beautiful multicolor advertising collar depicting pack of "Extra" cigarettes and 2 others. These were issued by the Commercial Agency of the Commissariatof Posts and Telegraphs and sold at P.O. counters at face value. Superb example!